I have been trying to catch up on writing blog posts for the last couple of weeks and I can’t believe I haven’t written about my newest challenge! I already wrote about how I signed up for the HAT 50K trail race that is on March 24th, and I actually began training for it 6 weeks ago. Training is going extremely well so far. Better than any training plan I’ve ever done, which is surprising because it’s higher mileage than I’m used to and includes 2 long runs each weekend. You can see the last 6 weeks of training on my Daily Mile page. What I haven’t mentioned yet is that I signed up for two MORE marathons in addition to the ultra. I know, I’m crazy. I decided I wanted to use my ultra training to run more than one race. This is a big deal for me because usually I run only two marathons a year, and they are at least 5 months apart. I want to do a road marathon in addition to the 50K because I’ve been running faster than ever in the last few months without really trying. Like yesterday when I ran 18 miles at a 9:09 pace, including 5 miles on trails. Didn’t that used to be my goal marathon pace??? I don’t know why this is happening, especially after I declared that I am not worried about my speed anymore, but now I am really interested to see how much time I can take off my PR (4:00:04). The 50K trail race will be about conquering the distance, and then the road races will be about speed. I knew I’d get sucked back into caring about how fast I can run! So all of this led me to sign up for two more marathons. One in May and one in June. Why two instead of just one? Why not? 🙂 Since marathons and traveling for them are expensive, we decided to do one local and one that required a good amount of travel. 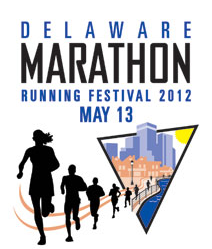 The first one up after the HAT 50K is the Delaware Marathon on May 13th. It takes place in Wilmington, Delaware, which is not far from my home of Philadelphia. It’s a small race, inexpensive, and mostly flat, so I think I can get a serious PR here. We also can stay at my dad’s house for the weekend which is only a 30 minute drive from Wilmington. The next one will be the Rock & Roll Seattle Marathon on June 23rd. We chose this one to travel to because of the timing (summer break for me) and because I have family out on the west coast. My aunt and uncle live in Oregon and have a boat that they keep in Seattle, so they will be there during the race which is very exciting for me! We are turning this race into a 10 day trip (from June 21 – July 1) so that we can run the race, spend time in Seattle, then go down to Oregon to see all of my family members that live there. It will be Kevin’s first time on the west coast and I’m excited for him to see how amazing it is 🙂 I’m not sure how well we will run since we may be jet lagged and tired from traveling, but the goal is to have fun. It was a little bit of a challenge to come up with a training plan for these races. I started with an ultra-training plan that is based off of Santa Clarita’s Ultra-Marathon Training Plan. I knew I needed to do two long runs each weekend (one between 8-10 and one between 16-26) and I liked how this plan incorporated that. I prefer to do the longer run on Saturday and the shorter run on Sunday. I also am doing one of my long runs each week (or part of one) on trails to get experience on different terrain and start feeling more comfortable. Then I used Hal Higdon’s multiple marathons training plan to come up with my plan for running in between marathons. I have 7 weeks between Marathon #1 and #2, and 6 weeks between #2 and #3, so I followed his recommendations for how to train in that amount of time. 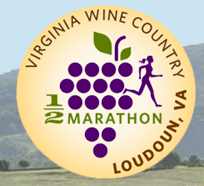 I also have two half-marathons in the mix: DC Rock & Roll Half on March 17th and the VA Wine Country Half on June 2nd. WHEW! That’s a lot of running. Of course, this plan is just a ‘plan’ and I know I may need to modify it depending on how I feel, especially in between marathons while I’m recovering. So far I have followed it to a T and it’s been awesome. I’ve felt great and strong, even during my double long run weekends. In addition to running I’m strength-training two/three times a week (Body Pump at the gym & Kettlebell at home) and trying to stretch and foam roll more frequently. This NEEDS to become a habit! Starting this week, I’m also attempting to do yoga once a week. The classes at the gym aren’t the best with my schedule but I know I can do it at home with DVDs, the internet, and On Demand. Yoga makes me feel so good, I know I need to do it! 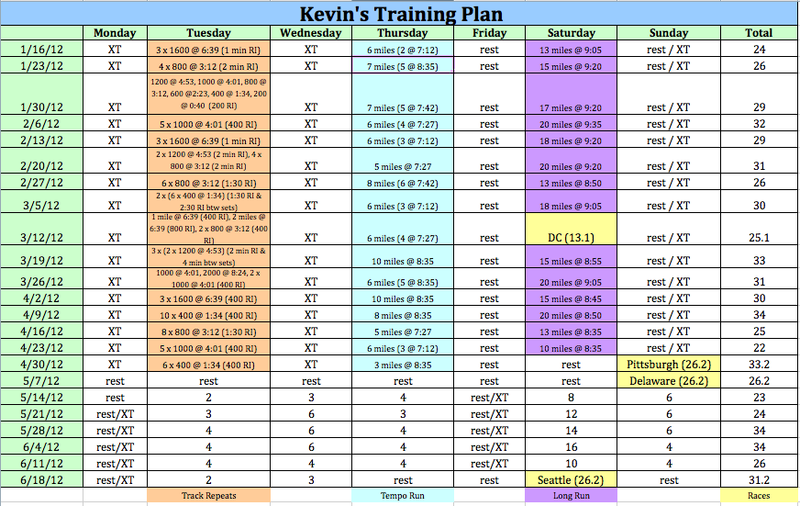 Kevin’s plan is a little bit crazier than mine. He will also be doing the Delaware Marathon and Seattle Marathon, but he’s going to run the Pittsburgh Marathon a week before Delaware! 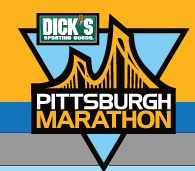 He’s a huge Pittsburgh Steelers fan and he loves the city, so this is his dream marathon. I’m not running this one because I’ve already done one in Pennsylvania, and I don’t want to spend the energy/time/money repeating a state. He will be following the FIRST training plan until this race, then in between the other races he will also follow Hal Higdon’s multiple marathons training plan along with me. This is the first time we’ve trained for different races and his plan is very different than mine (running 3x a week, cross-training 2x), so it’s going to be interesting training separately some of the time. I think it will be good for Kevin, because he’s so much faster than me and I hate slowing him down. However, it’s going to take a lot of self-motivation because he’s so used to running with a buddy (me). He said he’s ready for the challenge though. He has a time goal in mind (3:45) so his paces for each of the three key runs are very specific. His weekly mileage is lower than mine because each run is very intense. We are hoping that this is good plan for him because he tends to get injured (especially his knees) when running high mileage. I will be the first to admit that I am definitely not an expert on how to train for 3 marathons in 3 months. But I do have a lot of knowledge about running and training from my experience and research. I hope that our plans don’t turn into a huge fail, but I guess only time will tell. Until then I am EXCITED for this new challenge! Marathons #8, #9, and #10 … here I come! Yesterday I did something I never thought I would do! I signed up for an ULTRA-MARATHON! Back in July I mentioned that I wanted to run an ultra, but I had my eye on another race- the Umstead 100 (I would have done the 50 mile option). I thought about it A LOT and decided that it wasn’t the right race for me. For one, it is on a Saturday in North Carolina. This means I would have to drive at least 4 hours there on Friday after work because I can’t take any more days off from school this year (I’m using all my leave for our honeymoon). Then I would have to wake up super early to run on Saturday. I didn’t really like that idea. Plus, it would be expensive- $150 registration fee + hotel costs for two nights. We have traveled to a lot of races over the past 2 years and it’s really added up. Finally, it is a 50 mile race. I wasn’t sure if it was smart to make the jump from 26.2 all the way to 50, or if I could even do it! All of that led to my decision to not register for the Umstead 100. Now I am so glad that I didn’t because I found another ultra-marathon that is a much better fit for me! The HAT 50K Run. One of the things I liked when I found this race is that it is a looped course, which means I will be able to see Kevin 3 times and he can give me anything I may need (food, water, new shoes, socks, etc.). It is relatively cheap to register- only $70. Very inexpensive compared to most ultras! This race is on a Saturday, but it’s only a 2 hour drive from my house so it wouldn’t require as much travel time as North Carolina would have. I also wouldn’t have to stay in a hotel before the race because it starts at 9 am, and we are able to pick up our packet that morning. Another way to save money! Training would not start until late December, giving me a nice long break! My training would focus on distance, not time or speed. This is a huge deal for me. I’m so burnt out on running for a time goal because for the last 3 years I have been focused on running a 4 hour marathon. Now that I have finally done that I’m looking forward to training for a race where I don’t care how long it takes me to finish. Accomplishing the new distance will be my goal! It’s a new and exciting challenge! I’m so ready for a change after 7 marathons. I am planning on taking a longer break from training for big races next summer to begin the next phase in my life 🙂 I think that this will be a wonderful and satisfying accomplishment before that next step begins. Kevin can ‘crew me’ like I mentioned above. His support is so important to me and it will be nice to know he’s there. A 50K is a slightly less scary ultra distance than a 50 miler! It’s 31 miles. Can I really do that? The course profile is really scary. Check out these inclines! I’m also nervous about running on trails because that’s new to me. As you can see, the pros definitely outweighed the cons! I registered for it last night when registration opened at 9 p.m. It sold out in less than 15 hours! I am so excited for this new challenge! I have no idea how to train for an ultra-marathon and I know I have a lot of research to do. I do know that my training will involve an emphasis on “time on my feet” rather than mileage goals, and also incorporating trail running so I get used to that kind of terrain. So, can I do it? I guess we will all have to wait and see! I’m a planner. I love making plans and lists, and I love being organized (thanks to my Dad!) One of my favorite things to plan is my race schedule. 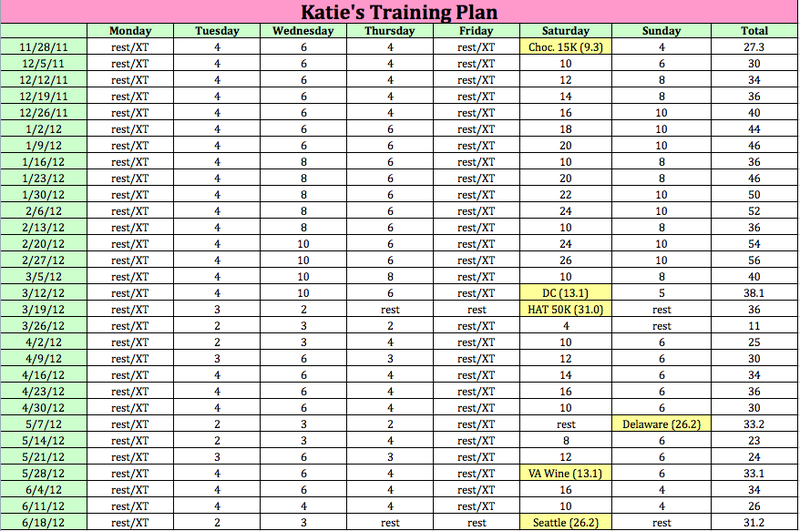 I also love making training plans. Since it takes about 16 weeks to train for each marathon, I really have to plan ahead and choose races that are timed far enough apart for me to have time to recover and then begin training again (usually one in the fall and one in the spring). Also, my big goal is to run a marathon in all 50 states, so many of my races involve traveling. So planning and thinking ahead is definitely necessary! For the last few years I have known which races I wanted to run and had my whole schedule laid out at least year in advance. The next race on the schedule is the Air Force Marathon in Ohio on September 17th, and for the first time ever I realized I didn’t know what I wanted to do next! It will be my 7th marathon in my 7th state. It’s early in the fall running season, so I’m looking forward to having a longer time in between my fall and spring races. So what’s next for me? That’s what I have been thinking about a lot lately. I don’t have any extra days to take off in the spring because I’m using them up for the honeymoon. So whatever I do it will have to be during my spring break (March 31 – April 8, 2012), or if the race is close enough it could be a quick weekend trip. It also needs to be a new state (obviously!). I will have already done Pennsylvania, New Jersey, Virginia, Texas, New York, Tennessee, and Ohio. I don’t want to travel too far because of money, so that’s a factor too. I found something that seems to be a good fit- It’s in Raleigh, North Carolina (which is a new state and only a 4 hour drive away), and it’s during my Spring Break. There’s just one detail that makes me extremely nervous – it’s an ultra-marathon! This means it’s longer than 26.2 miles. Not just a little longer though, this race is 50 MILES!!!!! It’s called the Umstead 100. It’s actually a 100 mile race with a 50 mile option. Um, yeah, 100 miles? No! I would be doing the 50 mile option, which is still a huge and overwhelming distance. Every time I finish a marathon I can’t imagine running another step. This would require me to run an extra 23.8 miles. When I think about that I get extremely scared and extremely excited at the same time. I love taking on new challenges, and I want to see if I can do it. 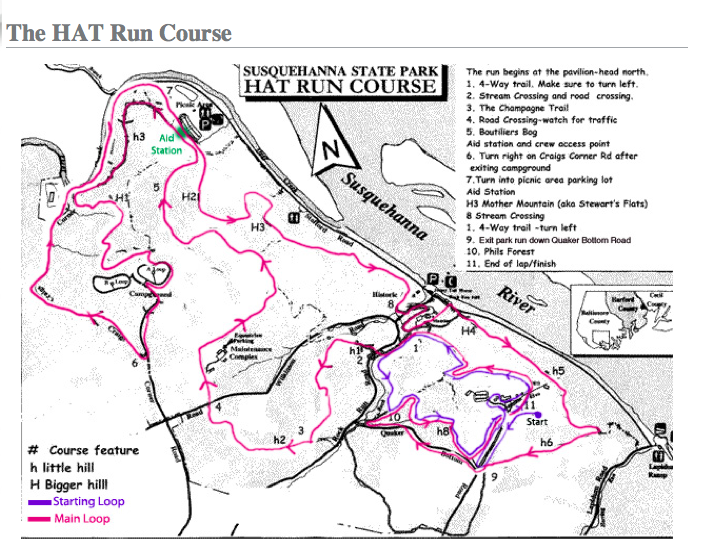 “The course is along a converted dirt road, which now serves as a running, biking and bridle trail through the Park. The trail width varies between 10 and 15 feet and the footing is excellent. There is no single track trail on the course. All creek crossings are on permanent bridges. The course’s surface is primarily fine packed powdered, granite screenings (1/16 inch and finer). This is an outstanding running surface. There is crusher run material on the vehicle access road portion of the course leading into Camp Lapihio and the S/F Aid Station (.4 mile). We continue to recommend a light trail type shoe but a well cushioned regular running shoe will do just as well on this surface. We also recommend gaiters to keep the small grit out of your shoes. I am not a trail runner so this type of course seems good for a beginner like me. There’s 28 weeks (about 6.5 months) between the Air Force Marathon and this race. I don’t even know how I would train for it! I’m sure it takes longer than 16 weeks though and involves high mileage to get used to being on your feet for a long period of time. Another cool aspect of this race is that they have aid stations, but you can bring your own ‘crew’ with you, which would be Kevin. He would not be running this with me because he has his own race plans for the spring (which will be revealed later once he decides for sure). So he would be there for me providing what I need and supporting me, which is awesome. A safer option would be the Myrtle Beach Marathon on February 18th, but that would only leave me 22 weeks between marathons and I would somehow have to take Friday off at school because the race is on a Saturday. This just seems less appealing to me right now, but Kevin’s parents do have a house there which is nice.